According to a new study published in the journal Psychoneuroendocrinology, researchers suggest that poor sleep may explain the impact of stress in kids. It is thought that getting a good night’s sleep may buffer how stress impacts the cortisol levels of kids. The hormone cortisol is responsible for the regulation of the immune system, metabolic system, and cardiovascular system. Long-term cortisol exposure may increase the risk of weight gain, depression, and heart disease. The study, conducted by researchers from Concordia University’s Centre for Clinical Research in Health and the PERFORM Centre, observed cortisol levels measured in saliva samples in 220 school kids between the ages of eight and 18. The children provided six saliva samples over a period of two days. The kids and their parents then answered questions about sleep habits, bedtime routines, and stress. The researchers found that poor sleep quality in kids promoted negative cortisol levels—regardless of length spent sleeping. Better sleep and other healthy habits can decrease the negative impacts of stress on the cortisol levels of kids, especially at the beginning of the school year. 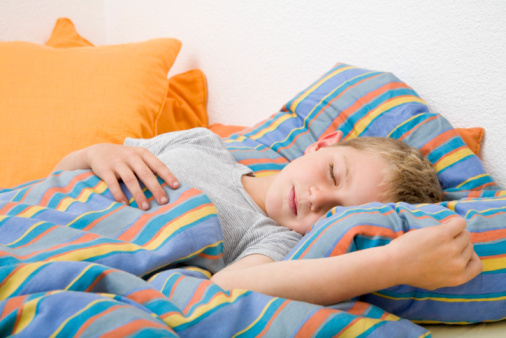 The National Sleep Foundation recommends that school children get between nine and 11 hours of sleep every night. “But it’s even more important that they get to bed early with regular sleep and wake times, avoid napping during the day and avoid using electronic devices before bedtime,” adds Ly. Ly, J., et al., “Poor sleep as a pathophysiological pathway underlying the association between stressful experiences and the diurnal cortisol profile among children and adolescents,” Psychoneuroendocrinology 2015; 57: 51–60, doi: 10.1016/j.psyneuen.2015.03.006. “Back to school and back to sleep: Poor sleep might explain how stress affects health in kids, research shows,” ScienceDaily web site, September 3, 2015; http://www.sciencedaily.com/releases/2015/09/150903131738.htm. “Children Sleep,” National Sleep Foundation web site; http://sleepfoundation.org/sleep-topics/children-and-sleep/page/0/2, last accessed September 4, 2015.